Sediment dynamics in fluvial systems is of great ecological, economic and human-health-related significance worldwide. Appropriate management strategies are therefore needed to limit maintenance costs as well as minimize potential hazards to the aquatic and adjacent environments. Human intervention, ranging from nutrient/pollutant release to physical modifications, has a large impact on sediment quantity and quality and thus on river morphology as well as on ecological functioning. 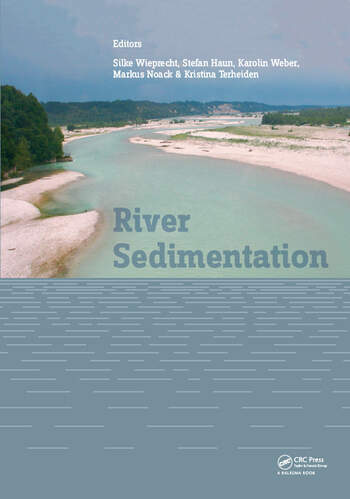 Truly understanding sediment dynamics requires as a consequence a multidisciplinary approach.River Sedimentation contains the peer-reviewed scientific contributions presented at the 13th International Symposium on River Sedimentation (ISRS 2016, Stuttgart, Germany, 19-22 September 2016), and includes recent accomplishments in theoretical developments, numerical modelling, experimental laboratory work, field investigations and monitoring as well as management methodologies. Microbial biostabilization and flocculation – what can we learn for sediment transport modelling? Prof. Dr.-Ing. Silke Ursula Wieprecht is a professor at the Institute for Modelling Hydraulic and Environmental Systems of the University of Stuttgart. She received her university degree in civil engineering from the Technische Universität München and earned her PhD degree from the University of Federal Armed Forces in Munich. She wrote her PhD thesis on sediment transport problems, especially the formation of bed forms. After three years working as a consultant engineer and three years as the head of the subject group of river morphology at the German Federal Institute of Hydrology, she became Professor at the University of Stuttgart, Department of Hydraulic Engineering and Water Resources Management in 2003. Her research interests include river mechanics and the interconnection with ecology. She has broad practical experience in river restoration, morphology and sediment transport, which covers physical modelling as well as numerical modelling of fluvial and sedimentological processes. Her special interest is in the interaction between surface water and interstitial and its impact on habitats. In her research team work is performed on safety issues of hydraulic structures, hydropower use in large and small scale, flood protection and floodplain modelling as well as reservoir and sediment management. Prof. Wieprecht is an active member of numerous Technical and Expert Committees that formulate guidelines for the engineering practice (e.g. river engineering, sediment management in fluid systems. Furthermore, she is a council member of the International Association of Hydraulic Research (IAHR), Deutsche Vereinigung für Wasserwirtschaft, Abwasser und Abfall e.V. (DWA), Deutsches Talsperren Komitee (DTK), and Hafenbautechnische Gesellschaft (HTG).